Martinsburg, WV – Circa Blue kicks off the holiday season with a brand-new Christmas album as they ready for their Christmas Concert Tour. Bells of Home is now released and available for digital and physical purchase at DawnKenney.com. Milton, West Virginia -- West Virginia national touring band, Circa Blue will perform at the Mountaineer Opry House in Milton this Saturday, July 2 at 7:30 p.m. Tickets are $15 for adults, $12 for seniors, and $5 for 12 and under at the door - no presales. The band and their booking agent, Liz DiSessa from Heart Roots Music, are donating 100% of the band proceeds, including merchandise sales, to a to-be-determined worthwhile flood victim charity fund. For more information on the concert, please visit mountaineeropry.com or call 304-743-5749. Circa Blue announces they will present and host the inaugural Circa Blue Fest from May 6-8, 2016. Circa Blue Fest is a three-day bluegrass festival featuring some of the most prominent artists in bluegrass today. This year’s line-up includes: Blue Highway, Trinity River Band, Jim Hurst, Circa Blue, Lonesome Highway among other talent. Callahan, Fla. (March 4, 2016) Orange Blossom Records is proud to announce the new album, Once Upon a Time by Circa Blue is now released and available for purchase at iTunes, Amazon, CD Baby, www.Circa-Blue.com, Orange Blossom Records and other fine retail outlets. Orange Blossom Records is proud to announce the new Circa Blue album, Once Upon a Time is now available to radio stations via AirPlay Direct. The album went live this morning and has already jumped to #2 on the service’s Top 50 AirPlay Direct Bluegrass Folk Albums monthly chart. Stations may also request a private digital download from the label. Physical copies will be mailed to stations in the coming weeks and the label will soon announce the official retail street date. Martinsburg, WV -- Circa Blue is proud to announce they will present and host the first annual Circa Blue Fest, this May 6-8, 2016. 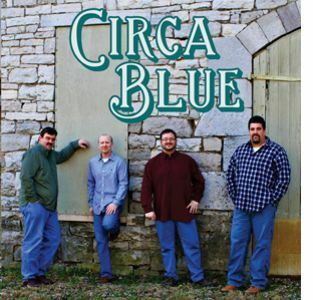 Circa Blue Fest is a three day bluegrass festival featuring some of the hottest acts in bluegrass today. This years line-up includes; Blue Highway, Trinity River Band, Jim Hurst, Circa Blue, Lonesome Highway and more! This is an all-ages, family friendly event with kids activities, award-winning BBQ, instrument and songwriting workshops and plenty of campsite pickin'! Callahan, Fla. (November 23, 2015) -- Orange Blossom Records is proud to announce they have signed CIRCA BLUE to the label and will release the band's new album, Once Upon A Time, in January. Callahan, FL -- Orange Blossom Records is proud to announce they have signed Steve Harris to the label and will release his all gospel solo album, Sundown in April 2015. Steve Harris announced that multi-instrumentalist and vocalist Teri Chism has joined the Circa Blue band. Harris welcomed Teri saying, "Teri brings a wealth of experience and skill, and is a perfect fit. With the recent addition of fiddle player/vocalist Malia Furtado and Teri, it has added a whole new dimension to Circa Blue." Martinsburg, WV -- Bluegrass band Circa Blue has released their self-titled debut album, featuring a number of originals, as well as the band's own unique spin on some traditional favorites. "This album is the result of hard work and a lot of heart," said Steve Harris, vocalist/guitarist for the band. "Our goal was to showcase our creativity and musicality, which I believe we captured perfectly. We strive to be unique and believe fans of all musical genres will find something they enjoy."